I haven't done many LO's lately its been all systems go with sorting out this house for bubba's arrival. We have managed to squeeze my scrap room into 1/3 the original space I had (I'm sharing a room with a queen bed grumphhhh) But I am more excited about getting the nursery painted before Mr Dan goes back to the mine so I can then totter around decorating the space. When Dan got back last week all he wanted to do was buy all the big baby items like the car seat, pram and change table so, thankfully we now have a room to house them in, lol. Other than all this fun excitement I have done a couple of LO's which I thought I'd share with y'all! 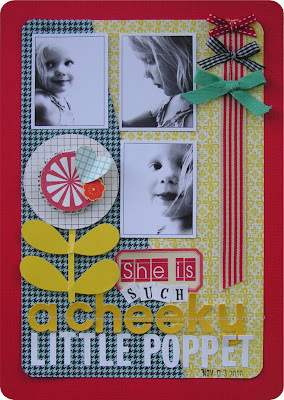 I also surprised myself with actually doing this months Scrapboutique stylist challenges. I am such a shocker, I never seem to find time to do them but this month I loved the girls challenges and given we didn't have the added stylist packs to work through I thought I have got to at least attempt them. Here's my take on the November Sketch/Stash Stomper set by the lovely Manon. Its all about the cheeky little poppet Miss Teleah. ...and finally last month I hosted the Blind scrap at our CC. The Sunday Roast was all about 'Halloween'. I got the girls to doodle or stitch on the page and create a shaped mount and photo by hand cutting. Here's what I did for the blind roast a bit of machine stitching for the spiderrrr web and a circular mount to echo the moon theme. Okay so thats about it everyone, thanks for stopping by hope your having a great week! Oh my god Em that spider web is fantastic!!!! I love the layout of Dan! !